With the summer season now upon us, Linda Belardi spoke to three aged care providers about what to expect when disaster hits. On Monday, 21 January 2013, ex-Tropical Cyclone Oswald hit the Queensland coast leaving a 3,000 kilometre, $1.06 billion trail of destruction in and around the Queensland city of Bundaberg. 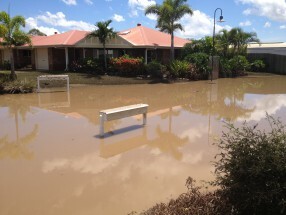 RSL Care Fairways Retirement Community was situated in its path and was significantly impacted by the natural disaster and associated flooding when the Burnett River broke its banks. In the largest evacuation ever undertaken by RSL Care, clients from the Fairways Retirement Community were evacuated to alternative sites and communities before the facility was inundated with floodwaters. RSL Care CEO Craig Mills says in total 108 residential care clients were evacuated within 60 minutes by a fleet of civilian, rescue and army helicopters. As part of the evacuation, residents were placed in other RSL Care facilities, neighbouring aged care providers that were unaffected by the flooding and with family members. “During the evacuation, we had a very short period of time to place all of our residents in appropriate care. We sent staff with our residents and ensured their medications and care planning was sustained,” says Mills. Mills says fortunately RSL Care had well-established emergency management response procedures and plans in place prior to the disaster, and management teams had previously participated in simulated disaster scenarios. 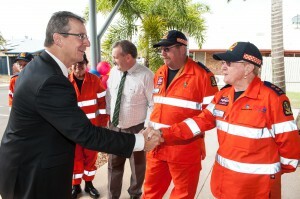 Staff were also able to draw on the knowledge of a number of staff members who had been involved in emergency evacuations in the past, such as Cyclone Yasi in Cairns. 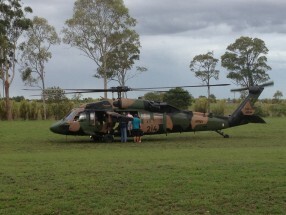 “These staff members were on hand during the Bundaberg evacuation to provide advice and assistance. We also had a great community who supported us both locally and nationally, with many individuals and organisations coming to our assistance,” says Mills. “One of the lessons we have learned from this major weather event has been the importance of building relationships with our stakeholders at a local level. Mills says RSL Care is currently working to improve stakeholder relationships at all of RSL Care’s facilities to ensure those vital local networks are in place. Management is also encouraging local managers to become involved in their local disaster management groups and to attend conferences and seminars on disaster response. Following the disaster RSL Care conducted internal debriefing and an evaluation of the organisation’s response to identify strengths and recommend improvements. One of the major changes in the wake of the event has been to provide additional resourcing and technology upgrades to the organisation’s call centre. “The RSL Care call centre was an outstanding asset during the weather event and provided invaluable communication linkages to the Brisbane office and those on the ground in Bundaberg,” says Mills. In light of this, the call centre is now operational 24 hours a day, seven days a week. Mills says the two most important pieces of advice he can offer is the importance of having a well-tested disaster management plan and keeping on top of site maintenance. “Having a good disaster management plan that is well tested will make a big difference during a disaster,” he says. The plan needs to clearly identify employees who will have a role in the emergency response and what their responsibilities will be. Running simulations will also help ensure staff are familiar with the details of the plan and their individual roles. “Being well prepared is vitally important, especially in the storm season. Although maintenance issues were not a problem for us in Bundaberg, we have learnt a disaster can occur with little warning at any location. Mills says he also regularly advises his managers to take a step back and scan their environments for any potential hazards. Due to the extensive damage caused to the Fairways site, the process of rebuilding has been slow and staged. In addition to the massive cleanup, almost the entire facility had to be rebuilt, with the first residents able to return to their homes on 11 March and the final residents by 29 July. In recognition of RSL Care’s timely emergency response and safe evacuation of all residents, the organisation was named Outstanding Organisation at the HESTA Aged Care awards in August. RSL Fairways celebrated its official re-opening on 4 September. The wild weather caused by ex-tropical Cyclone Oswald in January this year was the third time Blue Care has initiated its organisational-wide disaster management plans in just two years. Almost all of the 80 communities Blue Care operates in were affected by the violent storms but unlike RSL Care none of the organisation’s 260 sites were significantly inundated with water. Nevertheless staff faced fierce winds, power and network outages and even the threat of crocodiles and snakes swimming in rising waters. In Queensland, residential facilities were isolated in towns such as Emerald, Lowood, Gympie, Toogoolawah, Rockhampton and Gladstone, and facilities on the New South Wales far north coast were ready to evacuate, as were facilities in Logan and Bundaberg in Queensland. Blue Care’s northern services were first affected by the storm on 20 January and within five days the storm cell’s impact could be felt across the whole organisation. More than 60 sites had their IT and communication networks brought down and many sites also lost electricity and needed generators to keep powered. 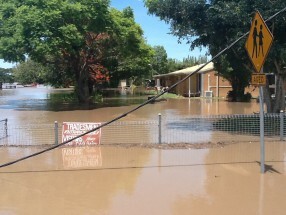 In Bundaberg, the city experienced its worst flooding on record and the river came within inches of facility doors. As part of the emergency response, approximately 80 residents were moved from the lower lying rooms at the Millbank and Riverlea aged care facilities to higher lying areas and contingency plans were in place in case a full evacuation was required. Obtaining accurate and up-to-date information throughout the disaster event was also a major challenge. “Misinformation or out-of-date messages were sometimes circulating on the radio, on social networking sites and via word-of-mouth. It could also be difficult to reach emergency groups on the phone due to the sheer volume of calls they were receiving at once,” she says. Staff therefore heavily relied upon the official social media sites of local newspapers and government authorities for information. In particular, the social media sites of Bundaberg Regional Disaster Management, Bundaberg City Council, the Bureau of Meteorology and the State Emergency Service proved incredibly helpful and assisted staff to prepare for the different stages of the flood. Farrar says that despite the severity of the floods many clients in the community did not fully understand the dangers and still wanted to go to the bank or visit their local pharmacy or supermarket, whereas others were panic buying. This meant staff had an important role educating the community about the need to be prepared but also easing the anxieties of others. Many staff members who were not personally affected by the floods chose to remain on-site to ensure essential services continued and assisted at the evacuation centres in their own time, Farrar says. Though water lapped the Bundaberg buildings there was only minor damage caused to the external property. However, some of Blue Care’s staff were not so lucky, with at least 40 staff members completely or partially losing their homes in Bundaberg and the surrounding areas. Reflecting on the events in January, Farrar says two things are essential to successfully managing a crisis – an updated emergency response plan and effective communication. Since the flood clean up, minor updates have been made to local emergency response plans in response to feedback from the Bundaberg staff and the central support team. In June 2012, Perth and South West Western Australia were struck by a one-in-a-decade-storm causing widespread power outrages to homes, hospitals and businesses in the region. In Bunbury, Bethanie lost electricity to two of its sites and immediately organised for two large industrial generators to be transported to the facilities to temporarily restore power. The storm also damaged the mobile telephone towers as well as landlines and power lines in the region, completely cutting the sites off from all forms of internet and telecommunication. As Western Power battled the biggest outage in its history, the utility corporation warned households and companies that the power outages would last several days. “When I arrived in Bunbury the two facility managers and the regional community manager had been in constant contact and had ensured that all staff had been assigned to maintain essential services and make care and safety a top priority,” says Chris Howe, Bethanie’s Chief Operating Officer, Residential Services. Arrangements had also been made with local providers so that fresh food was available and the laundry service continued. Without phone or internet contact, the organisation was forced to rely on old-fashioned methods of communicating, as staff from nearby facilities drove to Bunbury frequently to inspect the situation and report back to head office daily. Since the severe storms, Bethanie now has satellite phones so that communication can be maintained at all times and a list of preferred suppliers of industrial generators so that generators can be mobilised quickly in the event of a long-term power failure. In preparing for the future, Howe says ongoing training is essential to good crisis management, as well as debriefing and reviewing crisis management plans after a crisis. Read AAA’s coverage of the NSW bushfires which hit in October.